Amy Meng is a Kundiman Fellow and poetry editor at Bodega Magazine, as well as a 2016 Amy Award winner. Her debut collection Bridled dissects the the vulnerability of lovers as well as the limits of love in relation to happiness. Her poetry has appeared in Day One, Gulf Coast, Indiana Review, Narrative Magazine, and the New England Review, among others. She currently lives in Brooklyn. We spoke over e-mail about her new book. 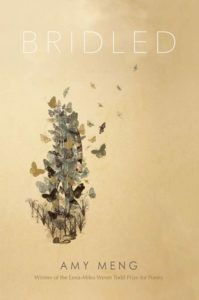 Bridled is a collection of poetry about why, as your website puts it, “emotionally intelligent people” enter into bad relationships. Did you set out to write a cohesive collection about this question, or did it happen organically? I started writing this collection, very loosely, during an unhappy relationship. The end of that relationship is what helped me focus the message I’d been afraid to fully vocalize during the time: that I was profoundly unhappy, even though I loved the person I was with. Many of the poems come from grappling with the idea I could be unhappy despite all my trappings of happiness — and that I needed to let go of some markers of security (which had felt so difficult to earn) in order to feel fully realized. There is a series of three poems, each titled “After Maine,” that appear in different sections of the book. Some readers may interpret them as three takes on the same experience, others may see the poems as connected by the realization the speaker comes to. Can you talk about your intentions with these poems? My partner and I broke up soon after going on vacation to Maine with my family. The “After Maine” poems were all written around that time, with Maine being one of the last comprehensively happy and together times we had together. “Song” is a poem that mixes beautifully lyric language with cacophonous sounds. There is a sunny quality to the imagery and playfulness in the sound effects that is appealing. This poem is striking because many of the poems in the collection have a darker tone: How would you describe your style and its shifts in this book? Some of the stylistic shifts are simply because the poems were written over the course of many years. “Song” was written when I was in graduate school, whereas many of the other poems were written in the years after, and more directly influenced by the aftermath of this one breakup. Can you describe the moment you knew Bridled was finished? I overhauled Bridled many times, from when I first started submitting the manuscript to after it was accepted, and continued to make pretty drastic edits even when finalizing the copy. I was wondering if I had time to overhaul it again when I received the final book in the mail. So, like writers often say: a book is never really finished. I took a long break from writing after completing Bridled. As a sufferer of trigeminal neuralgia, I’m slowly working on some poems about chronic pain and also learning to write essays, many of which are focused on family and cultural identity. Bridled by Amy Meng, available here.